I can’t even explain how much I love being a parent. I love all the fun we get to have in this house on a daily basis. I love playing tickle monster with him. I love listening to his super awesome adorable laugh. I love watching him sleep like the cute little baby that he is. I love watching him learn to eat. And the list goes on, and on. I love it! I could write a million more reasons why being a parent is such a joy, but my hands would fall off before I could type them all out. I think today’s video says more than I ever could anyway. I really treasure days like these. I know they won’t last forever, so I’m trying to take advantage of them every chance I get. Gosh, I love being this little boy’s dad. What are some of your favorite things about being a parent? What’s one of your favorite things to do as a family? I’m following you all on Twitter. What a precious little boy, I love his laugh also. And i have to say. you are very precious parents also! Thank you very much for the kind words. Do you have any children of your own? Like you seeing the smile on all my kids faces, and the laughter! Having older kids, we have gone thru some rough years, but wouldn't trade any of my kids for nothing! I loved our family trips, but with my husbands job hours we didn't get to go as much as I would have loved too! So we settle on what times we do all get together now! Oh yah…the teenage years… 🙂 We aren't there yet…..
What were some of your favorite family vacations?? NoahsDad.com wow no we went i guess maybe 20 years ago to visit my sister men and black just came out and we went to see that at the movies. LOve the laugh! My favorite thing about being a parent is watching my children grow and love others, and love God. Just being home with them is enough to make me happy. My oldest kids are busy with activities, so just hanging with them is nice. I have chosen to stay home with James and spending all my time with him is wonderful! Looks like most of us are loving the same thing. The laughter!!! When Emmie laughs it’s like on Monsters Inc when Boo blows all the lights out! No matter what you feel like you have to laugh with her. And as a family, nothing beats just a simple day… a picnic, laying on the grass, watching the kids run and run, til the sun goes down. my favorite thing to do with Liam is to snuggle with him at night. There is something about t his sweet little boy that I can't get enough of! My husband and I say we like to inhale him! Liam is my oldest of three, and has DS, and is the snuggliest, cuddliest of them all. Love this boy. Hugs and kisses, even when they are sticky and covered in chocolate or honey. By far the best feeling to have little arms wrapped around your neck. I love everything about being a mom. I think my single favorite though is when he just looks up at me, holds his arms out, and says "mama!" with the biggest grin. I'm just addicted to parenthood, its the best feeling I could ever imagine. Love it when, as today, my son tells me to shut up and listen. To listen to someone else, he decided to start Chairing the Meeting, which is not bad considering that he was in the back seat of the car at the time. Makes a change from being fast asleep as usual, LOL!" My grandson has Down Syndrome. My daughter found out when she was still pregnant with him and had a genetic test done to see if he had our hereditary skin disorder, she was only 22 at the time so we never dreamed that he'd have DS, but not only did the test come back to reveal he had our skin disorder (wasn't a big deal) but he had DS. My daughter called me devastated at first, but one thing that NEVER entered her mind was ending the pregnancy or getting rid of the baby through adoption. The Dr.s asked her many, times about abortion and finally my daughter got angry and told them "I already told you several time I'm NOT getting an abortion, I'm keeping the baby so leave me alone and don't ask me again!) She went about learning everything she could about DS to prepare herself for caring for this special little boy that was going to enter our family. Since then, he is now three years old and one of the greatest joys of our lives. Yes he went through a lot, heart surgery, we almost lost him due to a skin infection after surgery etc. but he's a strong willed little boy and came through it like a champ and is doing very well now. He's not walking yet, and barely started cruising but he's on his way. He doesn't talk, however he does sign a little and so does baby brother who's about a head taller than he is haha. Tyler also has a Mickey button to receive tube feedings at night, hopefully he'll be off of that soon, but he's an amazing kid with a wonderful sense of humor and shows so much love, but he also has his days where he don't even want to be looked at haha. His teacher used to always say "he's on Tyler time today" when he didn't want to do his therapy and he continues to be on Tyler time, but he's a great kid and she couldn't be happier that she chose to not even let it be an option of rather to keep him or not. She couldn't imagine life without him and neither could any of us. He's treated the same as the other two boys, his baby brother and their cousin so he's not treated any different other than we praise him over every small new thing he does that most kids learn naturally, even baby brother claps for him and praises him when he does something new and is successful. I just wish more people would think and get educated before making a lifetime decision. I also wish that more Dr.'s, nurses, and other medical professionals would stop making it so much worse than it is and stop encouraging or even pushing parents into abortion. Karen, it sounds like you have a great daughter. Is she on Facebook? You should tell her we'd love to see a picture, her little boy sounds like a cool little dude. And yes, we totally agree with you on how the medical community needs to change the way it delivers a down syndrome diagnosis. My wife is a pediatrician, and we're both really hoping some head way is made in this regard. Hi Rick, yes she is her name is Cynthia Hamilton and her icon is of two little guys standing in-front of the tv (they were watching Signing Time) the little one on the right is Tyler the three 1/2 year old or as I call him Punkie and the other one is baby brother Mason two years old. I'm sure she would be happy to hear from you and I think it's awesome that your wife will be one of the first out there to hear when a break through does happen. By the way your baby boy has the most beautiful blue eyes, I mean absolutely gorgeous. Have a blessed evening. Rick Smith I also whated to ask, is your little guy walking yet and how old is he now? Punkie just figured out how go forward on a sit and ride little toy. He finally figured out that he can use his feet to go forward as well as backwards lol. Also, do the two of you use Sign Language with him? I'm a Sign Language Interpreter and teach ASL at my church so I started signing to my grandchildren from birth which has been a huge help for us with both of her boys as Punkie's not verbal yet but can tell us if he's thirsty, hungry, wants to play ball as well as other things, and baby brother who's behind on his speaking as were all three of my boys were also is able to use it to tell us his needs instead of crying so it's really cut back on the "terrible twos." Some people believe that if you use sign with a hearing child then they'll never learn to speak which is impossible seeing how they are around hearing people all day and night every day it's only natural for them to learn it and depend on it, but for those children who are behind in their speaking, as well as when they are going through the terrific twos 🙂 it gives them a voice to let their parents and others in their life know what they need or want, also we thought Punkie was Deaf when he was little…well he was but after cleaning his ears and putting tubes in them his hearing improved to a hard of hearing status as if being under water and hearing people talk, that was how it sounded to him, however after awhile they have not long ago tested his hearing again and said his hearing is perfect, it was apparently due to the small ear canals that most children with DS deal with. But they both use it, now If I could get two of my other children who have babies to let me teach their babies sign language that would be awesome and would certainly help my oldest son with his two year old :). Keren, I hate to say this but there are very unlikely to be any medical break-throughs. More likely just a trickle of quite small improvements – there will not be a "cure" for DS. On the positive side, there are huge opportunities for improved public perception: our kids main disability is other peoples negative attitudes, and thats where we can all make a real difference on every block, in every village. Dont put too much faith in transgenic mice, OK? Karen, it sounds like you and I have similar stories. My daughter was also 22 when she found out that the baby she was carrying had down syndrome. Fortunately she was not pushed to consider abortion, I think they may have mentioned it to her once initially. My grandson will need to have heart surgery this summer or fall but was able to put that off until after his first birthday. Because of this condition she had to change obstetricians towards the end of her pregnancy and that doctor asked her if she was pushed in any way to consider abortion because apparently that is something they are trying to remedy in their hospital. I'm so proud of how she and her honey have handled the additional challenges that come with having a special needs child. We have been so blessed as a famly to have two wonderful grandsons and in April we are expecting our first granddaughter. I am intrigued by the idea of signing with them, we may look into that especially if James shows any signs of hearing issues or is non-verbal. He seems to do a lot of vocalizing already, and does the da da and ba ba so we will just wait and see. Life is a journey! Snuggling. Hearing their little voices say I love you mom. The hug before bed. Spending the day at the zoo. watching the star in the evening. Singing around the piano. Accompanying my son who plays the cello. Piling the five kids in the Expedition and taking a road trip. Parenting is one of the most difficult, most rewarding experiences in life and I am grateful to have been given the opportunity to raise these beautiful children! That sounds like a lot of fun! That’s so cool that one of your son plays the cello. How old is he? The best thing abt being a parent is the unconditional love tht overflows!!! the laughter the joys the ups and downs!!! i can go on forever y i love being a parent but i think id bore the pants off u!!! lol!!! Renae, we already know how much you love being a parent. I was just talking about you tonight at dinner. I was telling my wife how fun it is to see all your posts, pictures, etc. I love how you love your little boy! Keep doing what you’re doing….you’re making a difference in his life! lol omg love your videos so glad he didn't spit up on you dad. love his laugh how old is he? Oh my goodness! I just adore this baby! He has a great laugh, too! You know, this may be strange to say because I love all kids, especially my own (just a typical boy), but…there is just something about a child with Down syndrome that immediately melts my heart and immediately makes me love them as much as my own. Maybe, it's the soft features of their faces and their beautiful sparkling eyes. Maybe it's the warm inviting smile that you just don't get the same of with typical kids. 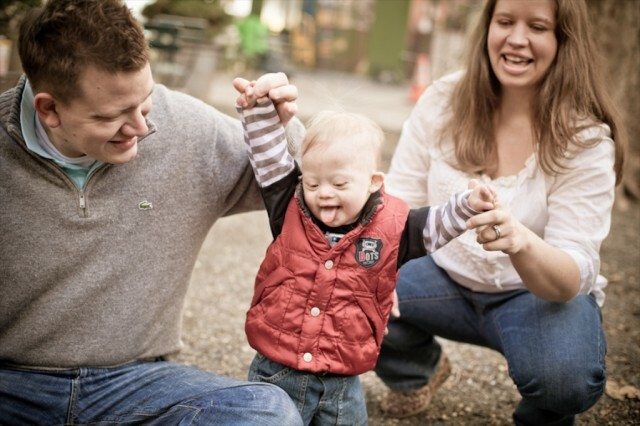 Either way, contrary to seemingly popular belief, the world would have a giant, empty, sad void without kids with Down syndrome. Keep up the good work educating people on the many ups of Downs. I think the three of you are absolutely amazing for what you are doing for society. We are all different, yet, of equal importance! Lots of love from my family to yours! Oops! I meant to say the world would have a giant, empty, sad void without PEOPLE with Down syndrome. It's very late where I am. That's my que that bedtime has come! Nighty night, sleep tight world! First, let me say…..I love this blog. What I love about being a parent is watching these beautiful little people grow. I watch as they show me everything I have tried to teach them and even some things that I thought they weren't listen to. My daughter with DS has such determination to show the world what she can co. She is amazing. The unconditional love we receive from them is the best gift ever. Our favourite thing to do as a family is to go camping with our trailer. Last summer for Jamie's birthday she wanted to go camping, so off we went. It is a great way to see different places and spend some quality time together as a family and I do not have to sleep on the ground which is an added bonus. Wow, it sounds like you guys have some great fun! How old are your children? And…thank you for the kind words about our site. I really appreciate it. …..when he starts dancing with even just the ABC song…that I sing. Gabriel finds MUSIC and RHYTHM in almost anything!. He conducts, arms rhythmically moving, as a conductor would! And his laugh warms my heart! Awesome laugh. One of our speech therapist told me that smiling and laughing is a great way to build the muscles of the mouth. Keep working out Noah! Rick our son is 11 and our chromosomally enhanced daughter is 9. Love this! That little laugh of his is enough to make anyone smile! I enjoy reading about how much you love your son! It is so amazing! That is why I am so glad I found your page and blog! It is so wonderful to see a family so involved and happy with life! This postive message you are sharing with us all makes my heart smile so much! I am so in love with my children! They are truthfully my everything! I still catch myself just staring at them and thinking WOW how did I get this lucky? It is so amazing to watch them grow and learn new things. My favorite thing about being a parent is watching my children interact with each other. When I see the love they have for each other, the way they care about each other, and the way they cheer each other on, it makes me so proud! I just love my babies more than words will ever be able to express. Oh my gosh…there were so many reasons why I love being a parent…but my favorite moment was when I was at the PT’s office and I was holding Enzo. He and I had this amazing moment and the PT said, “Wow, he is so in love with you!” I got really choked up! It was so true. I could see the love in his eyes and I know he could see the love in mine. Those moments happen a lot! Oh and yes….love that laugh! God gave you this gift because he knew just how strong of a Dad you would be! !